Here are our top picks for the routers with the longest range. 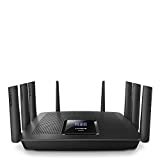 A wireless router is one of the most reliable devices that can offer you a great Wi-Fi connection with higher speeds and an excellent Wi-Fi range. With a high quality router you can connect to stronger Wi-Fi signals and stay connected at a greater distance than lower-quality models. Things like a stronger Wi-Fi signal strength and a larger coverage area size can allow you to get a lot out of your internet experience. A good device can make your internet experience better and allow you a greater number of connections. Whether you're looking for something with modern antenna technology or the longest range, you'll find your top pick for the best router from this list. It's going to be wise to take into account the kind of speed and power you're going to need, as that will help you with choosing the best router. The amount of LAN ports offered is also going to be important considering how many devices you may want to plug in. While Wi-Fi is generally more convenient and may have a decent coverage area, plugging into a LAN or Ethernet port can sometimes help with getting stronger Wi-Fi signals. One of the greatest routers on this list is the Asus RT-AC88U, which is able to offer an extended range for your signal throughout your entire home. It's a powerful device, capable of giving you an internet connection at fast speeds. The Asus RT-AC88U is without a doubt a great router that can offer faster speeds and a better browsing experience for you. With this device, you'll be able to make use of eight Gigabit LAN ports that will offer the ability to connect eight separate Ethernet compatible devices to allow gamers and professionals alike a secure connection. With a dedicated Wi-Fi connection, you'll be able to achieve the lowest ping-times for your intense gaming sessions. The Asus RT-C88U comes with 1024-QAM technology, which can help to create 80 percent faster speeds for your internet at 5GHz (2,100Mbps) and 66 percent faster speeds at 2.4GHz (1,000 Mbps). You'll be able to get expansive coverage in areas around your home and a safer experience that can protect you against malware. The Asus RT-AC8U has a four-receive antenna design that will increase the coverage range of your device. This helps to achieve a 33 percent greater coverage at the 2.4GHz range. The Asus also comes with MU-MIMO capabilities to offer each user a connection. With a simple web interface and TrendMicro vulnerability detection, you'll get an outstanding network monitoring ability that will keep you safe. You'll get an easy setup with the Asus RT-AC88U, as well as a built-in VPN as well as built-in game acceleration to allow for route-optimized servers. With this router, you'll definitely get the level of quality you expect from ASUS. Make sure to keep an eye on your connections to make sure the signal is even over each one if you decide to try out this router. There can be some bugs during setup. Some customers experience unbalanced connections. Many customers have loved this router, but the setup can be a little tricky so make sure to read instructions carefully and don't be afraid to call if you need help! When you want the best in Wi-Fi router technology and complete home coverage, the Amplify HD is a great option. The mesh networking that comes with this device is able to allow you a bigger Wi-Fi range and a faster Wi-Fi speed. You'll also be able to easily use it with a multitude of devices whether they are in your home or office. Unlike many other routers, the Amplify HD comes with a pair of accessories called “mesh points”. These points help create more speed and range for your connection. You'll surely be able to get a solid performance out of this robust mesh router that will be able to decrease the amount of internet dead zones you experience in your home. The Amplify HD will allow you to achieve internet speeds up to 5.25Gbps, which is definitely higher than some other options. You'll also get a range of 20,000 feet, allowing you to get a strong connection from just about anywhere in your home. With six high-density long-range 802.11ac 3x3 MIMO antennas, you'll surely be at the top of the speed statistic using the Amplify HD. Everything is made to be easy while using the Amplify HD, from setting up the network to checking the status of your connection using the multicolored LCD screen on the front of the device. If you're looking for something that will be able to offer a great range, the Amplify HD is an excellent choice. 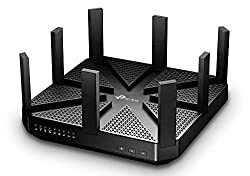 There have been problems with the protections for this router either not working well enough or causing connection problems with devices in the home. Interested in reading more reviews? Take a look at our selection of the best mesh wi-fi network systems. Helps achieve a faster connection. Some customers don’t find it to offer enough protection. There can be some “adapter error” alerts. This router has a great design and a lot to offer for those who want a top-notch device. Do make sure to test it out thoroughly for any problems as soon as you get it. If you're looking for routers that can make for a perfect addition to your home, the Linksys AC5400 Tri-Band Wireless Router is a great option. It offers two 5GHz bands that are excellent for gaming and streaming online video and a third band that is great for things like phones. Unlike many of the older routers, this one also has a lot of antennas which are perfect for ensuring a fast Wi-Fi speed. The AC5400 is a great device with exceptional range and excellent performance. It's also made to offer a faster possible Wi-Fi signal without affecting the speed of other devices in your home. This router has a larger size than other options, which gives the AC5400 a stronger Wi-Fi network that will work well for households or home offices alike. Sporting eight Ethernet ports, the AC5400 can be connected to devices using three Wi-Fi bands. It also offers 150 feet of range so that you can get the strongest Wi-Fi signal even without the extender while you're roaming around the house. Using MU-MIMO technology, it offers high data speeds and a longer range than other options. The AC5400 works well as a standalone router, but you can choose to push the device limits using the Max-Stream range extender if you want more. Do keep in mind that while features like the 1.4GHz dual-core processor, tri-band feature and ability to work with any devices open to the 802.11ac connection make it a force to be reckoned with, there may be an environmental factor or two that can wreak havoc on the connection for the AC5400. Do keep in mind that some customers have experienced problems with customer service helping them suitably. Solid connections for multiple devices. There have been problems with customer service. Customers sometimes lose their internet signal. This is a great router with a lot to offer, but make sure you hang onto all purchasing and warranty information, in case you need to contact customer service. 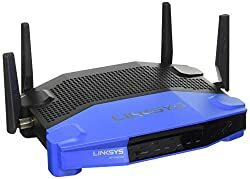 If you're in the market for an open source Wi-Fi router with excellent performance, the Linksys WRT1900ACS is a great way to go. It's as large device with a large footprint, which means it's capable of offering an excellent range and high-speed Wi-Fi for multiple users whether they're using it in their home or office. The WRT1900ACS comes with a slew of performance-enhancing additions, including 2.4GHZ (600Mbps) and 5GHz (1300Mbps) dual-band communication and beamforming technology designed to offer a powerful wireless signal. You'll also get the benefit of high-performance antennas that are adjustable and help to offer excellent speed and peak performance that tops out at around 1.9Gbps. With the dual-band technology offered by the WRT1900ACS, you'll be able to easily play games online or simultaneously stream Hulu or Netflix without any interruption. You'll also get the benefit of 4 lanes of Wi-Fi traffic to offer you the maximum Wi-Fi coverage and performance. While it lacks MU-MIMO technology, the WRT1900ACS still handles multiple connections with ease and speed. Setup for the WRT1900ACS is a snap, because you can use the Android App or Linksys iOS in the process. You'll be able to get every drop of power and use multiple devices in the same home with aplomb. The increased ability of the WRT1900ACS can take your wireless range and push it across the house, creating easy connectivity to your web browser across data traffic anywhere in your house. Some customers have had problems getting this router to connect to their devices. Can sometimes drop the signal. Linksys is well known for their routers and this one is no exception. If you're looking for an upgrade, this router is a great option. This is one of our favorite long-range routers. The Nighthawk X6 is easy to set up and offers three bands as well as multiple antennas and inputs. This router also uses Beamforming+ technology to offer you the ability to connect to devices easily and offer a max speed up to 3.2Gbps. The simple setup available for this router can make your life a whole lot easier. Installation is a snap and you can also keep control of your home network remotely through your iOS or Android phone. You can even use it with Amazon Alexa using voice commands, which is truly convenient. You'll also be able to monitor your home network using the Netgear Genie app. The Single Sign-On (SSO) feature that comes with the app also allows you to access all of your Netgear accounts from one place. On top of the tri-band technology that the Nighthawk offers, it can also make sure each of your devices is assigned an optimal Wi-Fi band so that it can function at its best. Some customers have noticed a decline in internet speed after using it for a short while, so keep an eye on your connection if you decide to try out this router. Can help to increase internet speeds. Offers three bands for connections. In some cases it can start rebooting frequently without cause. 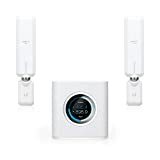 This NetGear router offers three different bands for connections and is easy to setup and use without over-complicating the process. The Portal AC2400 router offers a gorgeous, white design that makes it quite appealing. While you may not be able to see them, there are nine antennas inside this device that are made to offer you the ability to get into the router, “Fastlane”. Using a patented technology, the Portal AC2400 is able to steer your connected devices into Wi-Fi channels that allow them to avoid the reduced speeds that can come with Wi-Fi congestion. With the power of MU-MIMO technology, the Portal AC2400 will offer you a reliable router experience to power lag-free gaming or your computing and business work without a problem. The standalone Portal can cover up to 3,000 square feet by itself. If that's not enough for you, then you can add the Mesh 2.0 units in order to gain 3x more coverage and 10x faster speeds than other router models. 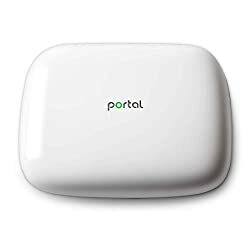 The Portal AC2400 is an excellent 802.11ac-equipped router that offers speeds that are three times faster than other options, including AC3200 routers. The Turbo-AC2400 Spectrum Boost also creates a better Wi-Fi signal while avoiding lag and other router problems. You can also get additional mesh units for the Portal AC2400, which you can use in your home to boost the range and speed. Customers have had problems with this router dropping the signal or being too difficult to set up. In some cases, the internet signal can be dropped. Can sometimes be difficult to set up. If you're looking for a router with an excellent design and a decent amount of power, then this is going to be a great option. If you want the highest possible speed, then TP-Link's AC5400 is going to be an excellent option. It's a wireless Wi-Fi tri-band router that demands fast speed and an even faster connection. This compact device is great for gamers and professionals alike, allowing you to achieve blazing fast performance. The Archer comes with a 1.4GHz dual-core processor; three co-processors in place to allow one for each wireless band. Along with the Nitro QAM technology offered by this device, you'll be able to fill every room in the house with a signal range that can reach up to 10,000 square feet. The three bands are made up of one 2.4GHz band (1,000 Mbps) and two 5GHz bands (2167 Mbps). With the Archer, you'll be able to reach 5,400Mbps Wi-Fi speeds capable of making sure your Wi-Fi comes with an extended range and a fast speed. This Wi-Fi router is desktop-friendly and uses MU-MIMO beamforming technology that can fill a house with a great connection and the fastest possible speeds. The Archer's signals range is capable of hitting the entirety of your home, eliminating dead spots. The VPN security offered by the Archer will allow you to keep your hard drives protected. It's also able to establish standalone connections for the devices you use with it. That way, no matter which room in your house you're in, you'll still be able to get high-speed signals and speed even more reliable than other options through the use of the high-powered antennas pair with the Archer itself. Make sure to track the kind of connection your getting, some customers have found that it starts working great but begins to fail after only a few months of use. There can be some connection problems. It can cease to work for no apparent reason. If you're in need of an upgrade and want something that will be great for gaming then this router is going to be an excellent option. This budget-priced router offers and excellent range. 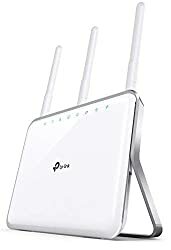 The TP-Link AC1900 long-range wireless router comes with high-powered antennas that will offer you a strong signal that can be connected to multiple devices. It can be used for 4k video streaming without interruption or your intense gaming sessions. Using dual-band networks (5 and 2.4GHz), you'll get a reliable Wi-Fi signal as well as beamforming strengthening connections. Set up for the AC1900 is a snap and you'll easily be able to use this budget device in a home or small office easily. You'll also have access to the TP-Link Tether app that you can use with your iOS or Android device to control and change settings on the AC1900. The AC1900 is able to allow 802.11ac connections easily. It's also cheap when compared to other options that can come at a price of $200.00 or more. The AC1900 has also been tweaked out-of-the-box in order to enable multiple devices and streaming services to be on a network at the same time. In combination with the AC1900s three detachable antennas, you'll surely get plenty of bang for your buck. If you're looking to save money while still getting an excellent router, then you'll have a hard time finding better than the AC1900. In some cases, customers have experienced that their Wi-Fi signals are being dropped by this router or that it stops working altogether. Can increase the power of your signal. Some customers have experienced a decline in signal strength. It can sometimes cease to work for no apparent reason. If you want something that will be able to offer a lot of power at a lower cost, then this is a fantastic choice. Are you interested to see other options? See here our guide about the best budget routers. For those on the hunt for a hotspot system that has a mult-unit design, Netgear's Orbi system is well worth a look. 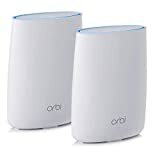 The NETGEAR Orbi Home Wi-Fi System is a tri-band system with plug-and-play simplicity that can put other routers to shame due to its capabilities. Furthermore, the system is made up of two separate units, including the Orbi Satellite and the Orbi Router. Both of these units work together under the same name, one as an extender and the other as the router. This holistic system allows the router and satellite unit to provide outstanding coverage that is sure to cover just about anything smaller than a McMansion. The two units by themselves can also provide enough of a coverage amount for a 5,000-square-foot-home. If you need more coverage than that, you'll also have the benefit of being able to string more units together in order to extend the range, resulting in a powerhouse unit with mind-blowing range capabilities. Technically speaking, the units work together to ensure that each Wi-Fi connected computer will be able to connect to the satellite or separate router under a unified name. Due to the power of each unit, it's going to be hard to beat the range offered in the overall package. On top of that, this device sits at the top of the list for best design because of its fantastic look. It's a pretty slick system that will allow you to get a great connection all over your living space. It has certainly earned its spot on this list! Some customers may find that the connection from this device can slow down or drop without explanation, while in some other situations the device can stop working entirely. In conclusion, this device has a great overall look and a lot of ability. It's a great option to use in larger homes as a result of the connecting units. If you're looking for something that can handle regular at-home usage, the Motorola N450 is a great option. It's a powerhouse router that some say can go so far as to handle 4K streaming. Due to the 802.11 b/g/n wireless connectivity, you'll be able to get up to 450Mbps using this device. In addition, the proprietary MIMO antenna can help to create fewer dead spots through the extended range it offers. The on-board DOCSIS 3.0 modem is also made with four upstream channels and eight downstream channels. If you want a wired option, there are also four Gigabit LAN ports that can give you plenty of connectivity. In addition, the transfer rate on this Motorola router is quite impressive, offering versatile network compatibility and as much range as possible. Because of the Power Boost wireless tech that Motorola has built into this device, you'll be able to get as much bandwidth as possible from the unit. It also uses industry standard encryption levels to protect you as you browse and reduce frustration and viruses. Furthermore, this router offers excellent specs and a MIMO antenna sought after among wireless-n technology. It's truly a well-priced router with a lot of great built-in features that you can also make use of freely without having to reconnect. Overall, if you're looking for something that can provide plenty of bang for your buck, this is a fantastic option. There can be some instances there can be some issues with the connection that require frequent rebooting as a result. Overall, this device comes at a decent price and is fully capable of saving you on years of modem rental charges. When you want a fast speed and an even faster connection, the Asus RT-AC88U is the top pick for this article. 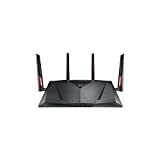 It offers the maximum Wi-Fi coverage area that will allow for the best possible connection for your home or office. You'll be able to get work done, surf the net, stream videos and play games with ease using this router. Whether you enjoy video streaming or an intense gaming session with your friends without any lag, the high-powered antennas on this device will surely offer you the best possible connection. You'll surely be able to find something that suits your internet needs without a problem from the routers listed here.